Water quality monitoring measures potential contaminants that fall into three categories: chemical and nutrient. and bacterial. A overly simplistic way to think of it is that chemical contaminants come from factories, nutrient contaminants come from farms and bacterial contamination comes from untreated sewage. PCBs are man-made chemicals that were used in electrical equipment like capacitors and transformers. Polychlorinated biphenyls (PCBs) are oily liquids or solids, clear to yellow in color, with no smell or taste. The good news is that we don’t make them and pollute our water with them anymore. That means that the other good news is that the level of PCBs is going down in the Delaware Bay. The bad news is that they are everywhere in the environment, last a long time, and are almost indestructable. PCBs are stable and remain in the environment at low levels for many decades,. However, the chemical is found to concentrate inside fish tissue, especially the fatty portion. Both New Jersey and Delaware issue advisories limiting the recommended amount of fish that should be eaten. The primary nutrient pollutant is nitrogen. Over abundance of nitrogen leads to low levels of water oxygen and fish kills. Nitrogen comes from fertilizer and farm runoff. When we discuss “water pollution” in the Delaware Bay, the discussion is focused on nutrients. Several strains of potentially dangerous bacteria live in the Delaware Bay and they reach potentially harmful levels in summer. The bacteria we hear most about is E. coli from untreated bird, human or animal feces. Birds are the primary contributor of E. coli in the Delaware Bay occasionally after a storm or flood the source is identified as human. In these cases shellfish harvesting is temporarily halted. Our bay water at Money Island is tested regularly for E. coli and no problems lately. Other types of bacteria can cause infection of open wounds. It is important to clean and disinfect skin abrasions when working in or around the bay, especially in summer. Overall our water quality compares well to surrounding waterways and is gradually improving. This was filmed at what is now planned as the aquaculture center with the marina in the background. Matt, Tommy and Tristan each had their own boats as soon as they were old enough to operate one. They managed to survive to adulthood. How can I invest in Delaware Bay fisheries? There are several ways to invest in aquaculture and fisheries. We used private investors in the past including a locally crowdfunded financing of a watermen under a split-catch arrangement. We are now exploring a wider range of options including recruiting additional private investment. Potentially one of the easiest ways would be through a crowdfunded securities offering. The Securities and Exchange Commission sets limits on how and how much an investor can invest in crowdfunded offerings. Nantuxent Seafood is not involved in a crowdfunded securities offering but may consider this option in the future. This blog post is written as part of the ongoing exploration of new sources of funding for growth. This is not an investment offering. The method of financial expansion eventually selected must consider the needs of our customers relative to their financial interest in our seafood. We must also consider the overall reinvestment plan for the marina and the working waterfront community. For more information, see the SEC website. Money Island New Jersey is the primary oyster landing port for Delaware Bay oysters. Nantuxent Seafood is not in the oyster business but we have working relationships with other oyster growers, harvesters and dealers. The local oyster industry is estimated to add $26 million annually to the local economy. Blue claw crabs (Callinectes sapidus) provide the largest source of revenue for Nantuxent Seafood. The Latin name means “savory beautiful swimmer”. 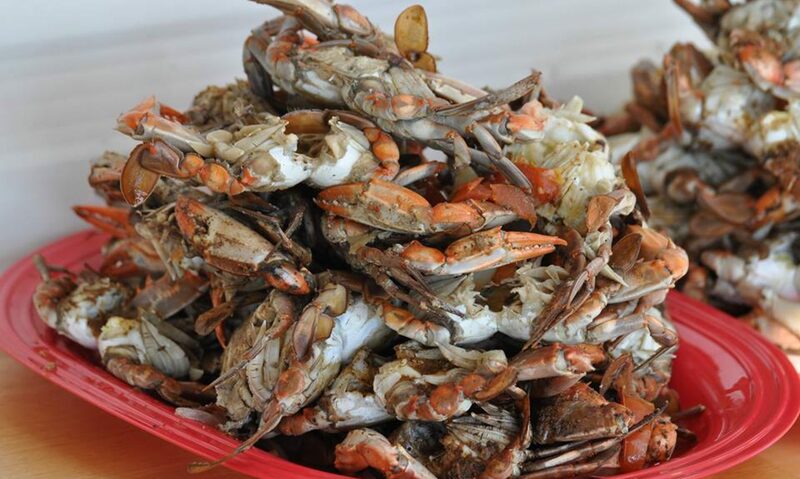 They are caught year round in the Delaware Bay but the traditional commercial harvest that incorporates the soft shell crab shedding season runs from March to October. We plan to continue to expand to larger volumes of crab sales each successive season. We sell six different crab products (three food products and three bait products) and have several more in development stage. Our goals are: 1) to provide a stable market for the crabs of local harvesters, 2) raise the income of crab harvesters, 3) provide seasonal employment for local workers, 4) provide a safer and higher quality food products to consumers. 5) provide bait to local recreational fishermen, 6) provide restaurants with a reliable source of local crabs. Yesterday I attended the annual alumni homecoming event for my alma mater Delaware Valley University in Doylestown, Pennsylvania. I am biased of course but I think DelVal is the ultimate stronghold of agricultural entrepreneurship in this part of the country. Many of the region’s farm and food company managers are fellow alumni. I sat with a classmate from the agricultural school with the same age and major. He and his wife listened to my story of seafood expansion at Money Island. Then I asked them what they did. They are both retired from a local pharmaceutical firm. Here I am just starting out in a new business venture at age 57. Classmates are retired. The contrast hit me hard. Our paths over the past 35 years since we parted at commencement in 1982 led to vastly different positions in life. We discussed the challenges of Nantuxent Seafood: dealing with government, rising water levels, Sandy recovery, and capital needs. They listened to my comments and offered words of encouragement “We know you’ll be successful”. Then they asked “How can we do to support you?” All I could suggest was that I am active on social media and that I am working on several crowdfunding ideas. We discussed why I thought crowdfunding was important to a venture like this. Community support for the future of sustainable aquaculture is as important as the funding itself. This conversation added to my inclination that I am ready to take the next steps in developing a support base through crowdfunding. During the day I received valuable bits of advice from the former college president, the former dean of the agriculture school, and a successful business person who was a wrestling teammate. I take it all quite seriously. By the end of the day I left with a short ‘to do’ list to help bring Nantuxent Seafood to the next level. This coming week I expect to complete my HACCP federal seafood safety training certification, talk with existing environmental partners and open discussions with new potential financial partners. Dredging the Delaware Bay is a controversial topic. Some blame dredging for the drop in fish stocks that effectively bankrupted the recreational fishing industry here. This seaway is essential to our economy and the arrangements to accommodate larger vessels have already been made. The observed effects on our local mid-bay waters have been minimal. This graphic summarizes the issues.